Let me start off by acknowledging that this post is both personal, and promotional. If you’re not interested in either, you can just skip reading it. I’ve always loved to talk about gardening with my friend and neighbor, Shelby. 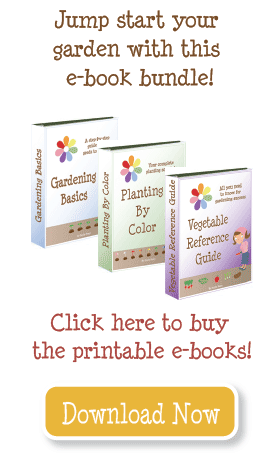 Every year for my birthday she would bring me peonies, and offer me advice about planting flowers in the front, and I’d share what I’d learned about vegetable gardening. She always wanted a garden, but it was hard. Shelby struggled with health problems, and would sometimes be in bed for weeks at a time. Every year she tried, but often ran into trouble. One year it was her cat choosing to use it as a litter box. She loosely installed chicken wire around the gardens. Another year she was too sick to do much. And a constant problem was that of irrigation. In the corner of the two boxes was a spot to put a sprinkler head. I kept trying to figure out a way to build some irrigation and tap into the existing sprinklers. I knew how to do low pressure drip irrigation, but I was pretty sure I couldn’t combined low with high pressure on the same line. Each season I meant to figure that out, but five years passed. This past summer Shelby’s daughter took an interest in the garden, and so our youth group went and prepared and planted the gardens. We added compost, some peat moss (it was pretty low), rigged up a trellis, etc. We created a garden plan, planted seeds, and then left Shelby’s daughter in charge of watering and buying a few plants (tomatoes, peppers). It was big (4’x4′) but light and easy to handle. The system was super easy to setup and install, and it came with clear directions. I purposely didn’t have it cover the entire garden because the tomatoes were growing on the end. They don’t need as much water as everything else, so it was easier to hand water them. 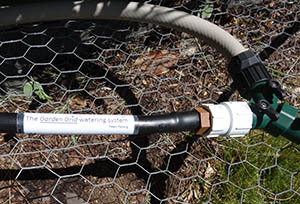 The two grids of irrigation came together with the Y connector. We attached the end to a garden hose, and voila, WATER! Some of the things I LOVED about this system–first, the Y connected had two little black switches. They controlled the flow of water. This makes it super flexible for those with high or low pressure coming out of the hose. It also allowed you to control how quickly your garden gets watered. Second, the holes in the irrigation tubing are much larger than a drip system. I found you could saturate the garden much more quickly than with my drip system. 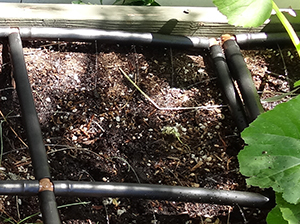 Finally, the irrigation system divides your garden into 1’x1′ sections. It does “double duty” as a grid, and watering system in one. This was a perfect solution for Shelby’s garden. Her daughter diligently watered and tended the garden, and had some of their first success this year. Garden in Minutes also sells the system with a timer, so you don’t have to remember to turn the water on and off every day. As the summer came to a close, Shelby passed away. I shed many tears as we celebrated Shelby and her life. She was so full of love and life, but had suffered for so long. It was bittersweet. I listened to many people tell story after story of how Shelby never talked about her pain, but instead turned the conversation to the other person “How are YOU? What’s going on with . . .” Now I wonder if Shelby’s interest in gardening was about the vegetables or about being interested in me, and my interests. Either way, I was so humbled and grateful that I had the chance to give Shelby a garden, and, thanks to the folks at Garden in Minutes, an irrigation system. For the first time her family enjoyed fruit from the garden. So THANK YOU Garden in Minutes, I’m sure you had no idea what a gift you would give to me and to my friend Shelby. I checked out the link to Garden in Minutes thank you for sharing that link with your story too. Its a gift you share your knowledge with others. Ohhh, what a bittersweet story. So glad you were able to share some gardening time with her. Sorry for your loss. Maybe you can dedicate this year’s garden to Shelby.